The Riviera Custom P93 Royale uses not two but three Epiphone Dogear Classic pickups for a punch that leaves all other three single coil pickup guitars in the dust. 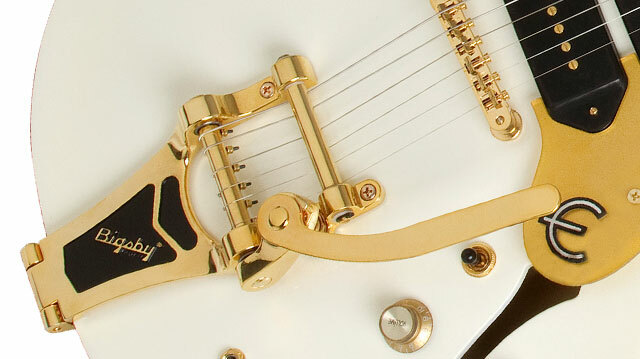 And when matched with the bell-like tones of the ES-style body plus a stunning Pearl White finish, sparkling gold trim, gold hardware, and a gold Bigsby B70 tremelo, the P93 Royale is truly becomes of our era’s great instruments and perhaps the most striking of the Royale family. Epiphone Riviera Custom P93 is protected by the famous Epiphone Lifetime Limited Warranty featuring Gibson 24/7/365 Customer Service and guarantees the instrument against defects in materials or workmanship. Experience an Epiphone Riviera Custom P93 soon at your favorite Authorized Epiphone Dealer. Controls 3-volume and 1-tone control. 3-way selector activates neck, bridge, and combination neck and bridge. Middle pickup active in any position adjusted with volume control. The Riviera Custom P93 is constructed of premium laminated maple with a mahogany center block and a hand-fitted, glued-in mahogany 24.75” scale neck with a SlimTaper™ “C” profile and 22 medium jumbo frets with a 1.68” nut for great string spacing and intonation. Other details include a rosewood fingerboard with pearloid Parallelogram Inlays. The Riviera Custom P93’s fabulous semi-hollowbody sound is voiced by three Epiphone Dogear classic P90 pickups with Alnico™ V magnets. Controls include 3 Volumes and 1 Master Tone. The all-metal toggle works as it would with a 2-pickup guitar with the rhythm position activating the neck pickup and the lead toggle position activating the bridge pickup. The middle pickup can be used in any position by adjusting its volume control. Quality electronic parts include full-size, 1” 500K Ohm potentiometers, Epiphone's all-metal pickup selector switch, ‘60s era Epiphone logo on the headstock, and a heavy-duty output jack. The Riviera Custom P93 Royale’s pearl white finish and gold sparkle binding are complimented by a one-of-a-kind Epiphone gold pickguard. 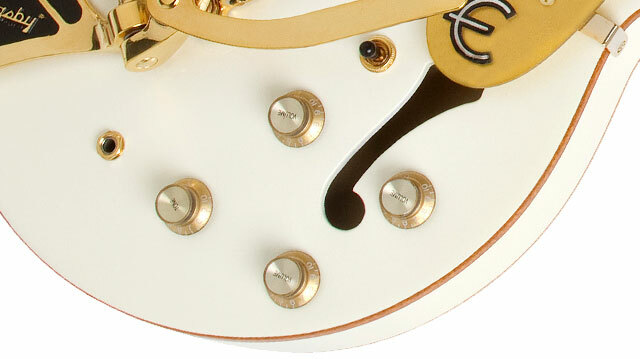 The Riviera Custom’s gold hardware even extends to the premium 14:1 ratio Wilkinson® machine heads which provide superior tuning stability and accuracy. 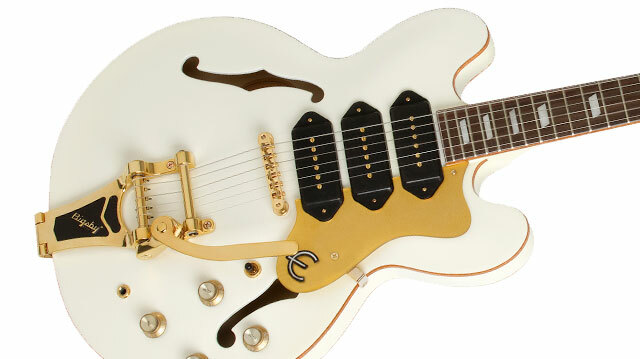 Also included as standard equipment on the Epiphone Riviera Custom P93 is Epiphone’s exclusive LockTone™ locking Tune-o-matic bridge plus a gold legendary Bigsby B70 tremolo.